AMERICANS MAY HAVE purchased Alaska from Russia in 1867, but they didn’t really discover it until the summer of 2008. I moved from rural Alaska to Washington that August, and one of the strangest aspects of the experience was picking up The Washington Post in the mornings and beholding a front page that could without much imagination have been that of the Anchorage Daily News. On July 29, a federal grand jury indicted Ted Stevens, Alaska’s senior senator, on felony charges of filing false financial disclosures—the first indictment of a sitting senator in twenty-seven years, leveled at the chamber’s longest-serving Republican. Don Young, who had served as Alaska’s lone representative in the House for thirty-five years, was himself reportedly embroiled in not one, or two, but three separate criminal investigations. And then, suddenly, there was Sarah. For Americans who live below the 50th Parallel, Sarah Palin’s debut alongside John McCain in a Dayton, Ohio, basketball arena on August 29, 2008 marked the beginning of a strange new political era. For Alaska, it marked the end of one. Amanda Coyne’s and Tony Hopfinger’s book is the first comprehensive account of the latter: the remarkable season in Alaskan politics that propelled Palin into office, unseated Stevens, and threatened to all but destroy the state’s hegemonic Republican Party. If you accept the premise that the trajectory of American politics bent rather severely with Palin’s national debut, Crude Awakening is important reading. Its authors, who are Anchorage-based journalists, have appropriately little to say on the well-worn subject of Palin’s emergence as a national phenomenon, but their book does offer a sobering object lesson in the Lorenzian dynamics that occasionally re-order politics: the way a butterfly flapping its wings in Juneau can produce a Herman Cain. Coyne and Hopfinger are muckrakers of the old school—you may recall the photograph of Hopfinger handcuffed by Tea Party standard-bearer Joe Miller’s security detail at a campaign event in 2010—and true to the form, their book is at heart a morality tale. It begins in the winter of 1955-1956 in the icebound university town of Fairbanks, where fifty-five delegates gathered from the far corners of the territory to draft the constitution of what they hoped would soon become the State of Alaska. The Alaskan statehood movement had built steam quickly in the postwar years, drawing on the far poles of Alaskan political identity. Like the western states in the continental United States, Alaska’s frontier culture had always been shot through with a Wild West libertarianism that resented the meddling of what Alaskans simply call “Outside.” But the catalyst for statehood was the military-driven urban construction boom of World War II and the early Cold War build-up, which had attracted a class of progressive-minded lawyers and bureaucrats from down south. Washington’s disinterested territorial rule offended both sensibilities: it allowed corporations from Outside to run roughshod over local commercial fishermen and small-claim miners, and it denied civic-minded émigrés the ability to determine the future of their communities. The constitution, consummated by Congress’s passage of the Alaska Statehood Act in 1958, represented the fusion of their disparate hopes. “Many still say this represented Alaska’s finest hour,” Coyne and Hopfinger write. That hour ended in 1967 when a team of petroleum geologists sunk a test well into the Arctic coast at Prudhoe Bay. As the drill inched down beyond 8,000 feet, it loosed a stream of natural gas “with a roar,” one of the geologists later wrote, “that was something like the rumble of a jet plane overhead that you could not only hear but feel through your feet.” The team had happened upon the largest known oilfield in North America. A pipeline connecting the North Slope to the port of Valdez opened in 1977. For the next thirty years, the near-entirety of Alaska’s economy would travel through it. Prudhoe Bay, in Coyne’s and Hopfinger’s telling, was Alaska’s original sin and Faustian bargain rolled into one: it allowed the state to underwrite its libertarian fantasies at the expense of the progressive idealism that had enabled the push for statehood. By 1980, Alaska was the only state without an income or sales tax, and it offered an annual dividend payment to all Alaskans—$1,174 this year—from the state’s oil revenue investments. But if the new system seemed like a model of small government to its beneficiaries, it appeared somewhat less so to the oil executives in the boardrooms of Houston and London, who grew alarmed by their far northern partners’ growing penchant for treating the oilfields as a bottomless bank account, and taxing the industry accordingly. Coyne and Hopfinger are astute in assessing the role that the still-young state’s psychological baggage played in its early dealings with the oil majors—Atlantic Richfield and Exxon and later BP and Conoco Philips—who Alaskans viewed as heirs to the rapacious legacy of the fishing and mining corporations of the territorial era. Anti-tax Republicans were making gains in Juneau in the early 1980s, but in order to take advantage of their ascendance, the oil companies needed “a real presence in Alaska, not just in the hallways of the Capitol but among the business community and politicians who supported industry.” What they needed, in short, was their own Alaskan—someone who could first defuse, then exploit the state’s deep-rooted resentment of interlopers. That Alaskan turned out to be a man named Bill Allen. A hard-bitten son of Depression-era New Mexico, Allen had come to Alaska in 1968, when he was in his early thirties, to work as a welder on the North Slope drilling platforms. Eleven years later he cofounded an oilfield services corporation called VECO, and as the company grew he used it as a platform for making inroads into state politics. By the late 1980s, Allen had become the oil industry’s foul-mouthed, gravel-voiced guardian angel in Juneau. Allen’s moment arrived in the early 2000s, when Alaska began to negotiate a grand bargain with the oil companies. The idea was that the industry would build a pipeline to carry natural gas from the North Slope—the next great golden goose that would keep the state fiscally solvent as oil began to run out—while Alaska would lock in tax rates on oil producers, erasing the uncertainty of the past. The stakes were so enormous—a tenth of a percent given or taken away in the tax-rate negotiations meant billions of dollars in revenue—that Frank Murkowski, who had spent twenty years representing Alaska in the U.S. Senate, ditched his seat for the governor’s mansion in 2002, in hopes of seeing through the deal. On his way out the door in Washington, he appointed his daughter Lisa to finish his Senate term, snubbing an up-and-coming small-town mayor and loyal supporter named Sarah Palin. Those familiar with the Palin origin myth know what happened next. Appointed to an obscure post on the state’s oil industry oversight panel alongside the state GOP chair, Palin promptly unseated him with a conflict-of-interest complaint, establishing herself overnight as a homespun reformer tilting against the old guard. Her timing was impeccable. Frank Murkowski was negotiating the pipeline deal out of public view, and his constituents were beginning to suspect that the industry-friendly governor was giving away the store. Stevens and Young, enjoying influential committee posts at the apex of Bush-era Republican hegemony in Washington, were funneling an astounding level of federal subsidies back home. Even Alaskans, who had always delighted in soaking the feds, were a little embarrassed by the Bridge to Nowhere. Then the other shoe dropped. Negotiations over the pipeline legislation collapsed, and Alaskans, who by now had come to loathe Murkowski and his political network, handed Palin a landslide victory in the Republican gubernatorial primary that August. A week later, federal agents raided the offices of six lawmakers; a dozen politicos, lobbyists, and oilfield services executives were ultimately indicted. Palin was elected governor in November, and as Democrats swept races nationwide, Stevens and Young lost much of their influence in Washington. In July 2007, federal agents raided Stevens’s vacation home in the Anchorage-area ski town of Girdwood in search of evidence of his VECO connections. Young was reported to be the target of his own VECO-related investigation, and by mid-2007 had spent $250,000 of his campaign funds for the year on legal fees. There was a sense of insurrectionary delirium in Alaska in the period that followed, a feeling that the old political order had been irrevocably scrambled—that the state, after three decades of political torpor and slavish reliance on the oil industry and Washington, was getting a clean slate. “I consider this a Jeffersonian moment,” Ethan Berkowitz, a democratic state representative who was challenging Young for his U.S. House seat—and leading in the polls—told me in July 2008. And then on the evening of August 24, John McCain placed a call to the cell phone of America’s most popular governor. Almost two years to the day after Palin’s toppling of Murkowski, Alaska’s revolution was over. Coyne and Hopfinger portray Palin as many others have done, as a shrewd political opportunist driven and eventually undone by her tightly held resentments. (Coyne, to her credit, was onto the governor’s shortcomings long before most journalists in Alaska and elsewhere, begging off of a contract for a Palin biography early in her governorship after coming to the conclusion that Palin was a less impressive figure than Alaskans at the time believed her to be.) 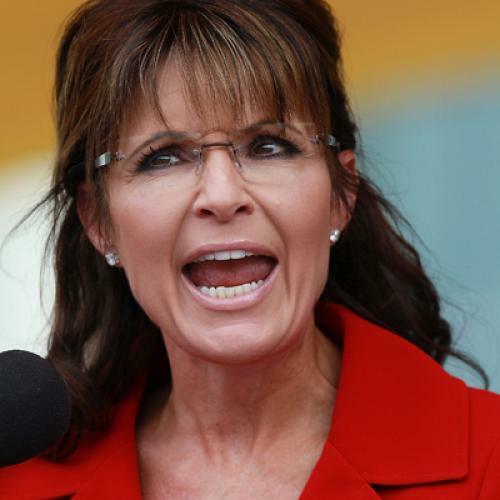 If the oil-stained machine pols she toppled had come to power by taking advantage of Alaskans’ self-interested id, Palin had done something worse: she had taken advantage of Alaskans’ civic-minded superego. “For a brief moment under [Palin’s] tenure,” Coyne and Hopfinger write, “Alaskans largely came together and were reminded of the idealism around which the state had been formed in the first place.” Palin had offered voters a second chance to choose the Alaska of its founding fathers over the Alaska of Bill Allen. And then, when opportunity called from Phoenix, she snatched the dream away. Crude Awakening captures the slightly dazed and sheepish air in Alaska today, the sense of a state looking back over the past five years and wondering, What was that? The reversal has been remarkable. As of a July poll, only 39 percent of Alaskans had a favorable view of their former governor. The case against Stevens collapsed farcically amid mishandling by federal prosecutors, and the senator was cleared of all charges in April 2009, five months after Alaskan voters ended his forty-year career in Washington. Sixteen months later, en route to a fishing trip in Alaska’s Bristol Bay region, Stevens’s floatplane crashed into the side of a mountain, killing the pilot and four passengers, including the man Alaskans called Uncle Ted. Meanwhile, the grand scheme that was supposed to ensure Alaska’s economic future is in grim shape: a plunge in natural gas prices has all but scuttled plans for a North Slope gas pipeline, while Palin’s successor in the governor’s mansion, her former lieutenant Sean Parnell, has quietly tried to claw back most of the oil and gas tax increases that were the cornerstone of Palin’s aborted legislative agenda. “It may well be,” Coyne and Hopfinger write, “that things happen in Alaska that wouldn’t happen in states with long histories and established social networks—places where physical magnificence and an excess of natural beauty, set always in nature’s extremes, don’t overwhelm, don’t usurp the senses, senses that otherwise might be used to create stable, well-run communities.” The authors return often to this explanation of the state’s political malaise, threading it through long, rhapsodic passages about the Alaskan landscape and way of life. I’ll attest to the Last Frontier’s sense-saturating extremity, but the rest, I’m afraid, is a bridge too far. As anyone from New Jersey could tell you, corruption does just fine in the absence of natural beauty and frontier naiveté. And one suspects that Alaskans’ sudden intolerance of corruption in 2006 might have had something to do with the fact that for the first time Alaskans—not the oil companies, not taxpayers in the Lower 48—were on the losing end of their politicians’ machinations. It is telling that Coyne and Hopfinger resort to Alaskan exceptionalism in their otherwise sharply skeptical account of how things went wrong in the far north. For exceptionalism—a department in which the forty-ninth state is exceeded by few save maybe Texas and New York—has always been Alaska’s great weakness. Both Allen and Palin ascended to power by playing expertly upon Alaska’s sense of itself as a land apart, a place where the normal rules didn’t apply, home to a hardscrabble but big-dreaming people destined for a unique greatness. Their respective downfalls, appropriately Alaskan in scale but utterly prosaic in kind, carried a different lesson: Alaska might not be such an unusual place after all. Charles Homans is a special correspondent for The New Republic.